This weekend more than 50 national and international designers, artists, and illustrators will present their creations at the 5th edition of the Berlin Graphic Days, taking place at Urban Spree in Berlin. 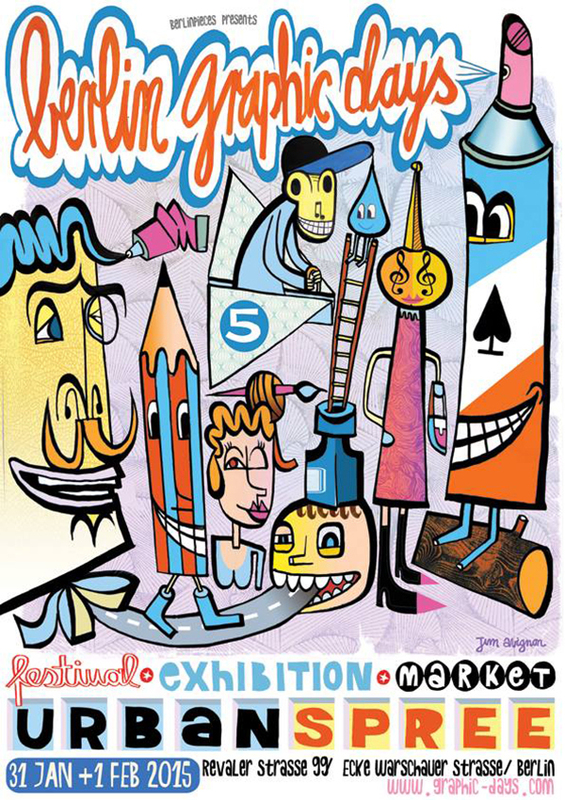 A great chance to not only see, but also buy unique pieces of art, screen printing posters, T-shirts, books, paintings and a lot of original graphic works. With live painting shows, DJs and food. This Winter Edition has a special focus on France with 25 invited French artists. This year’s headliners include Jim Avignon, Lars P. Krause, Bender, Stab, Agrume, Annabelle Tattu, Khwezis, Romain Froquet, Mister X, Leyto, Hannah The Random, Djalouz, Resoner, Pablito Zago, Marco Wildner, Flocke//Art, Nikkifaktur, Anka Büchler, Robert Richter and many more artists. Tonight at 9 pm at Konzulát, Leipziger Straße 60, 10117 Berlin – more information here. This was written by tw. Posted on Friday, January 30, 2015, at 16:38. Filed under DIY, advertising, art, berlin, color, comic, concerts, design, events, exhibitions, festivals, illustration, image, independence, installation, literature, magazines, music, print, products, publications, recommendations, typography. Bookmark the permalink. Follow comments here with the RSS feed. Post a comment or leave a trackback.